Tsitsernakaberd is a memorial honouring the memory of the victims of the 1915 Armenian Genocide that took place in the Ottoman Empire. It is estimated that over one million Armenians were killed in the genocide. 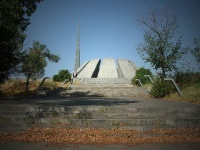 The monument is made up of two sections: the 140-foot (44m) stele symbolizes the national rebirth of Armenians, while the circular construction of 12 slabs represents the 12 lost provinces in present day Turkey. Every year on 24 April, Genocide Remembrance Day, hundreds of thousands of people gather at the monument and lay flowers. The attached museum tells the story of the genocide through photographs, films and newspaper clippings.